Damaged? Unmanageable? Not Your Hair! With new technology and so many options out there, I had thought we were past the days of putting mayo or raw eggs into our hair. It seems like something our parents would have done – like using baby oil to sunbathe or using an actual iron and ironing board to straighten our hair. Women of color have a tough time because their curls are generally so tight that they prevent the natural oils our scalp produces from spreading evenly through the hair. As we’ve learned in previous blogs, our hair is made from keratin proteins. Styling our hair often requires chemicals, especially for women who are trying to straighten their tight “S” curls. These types of products break the keratin proteins, leaving hair damaged. To keep hair healthy, we need to put protein back into our hair. One of the greatest sources of protein is egg whites, which is the basic ingredient in mayo. Other home remedies for replenishing hair include avocado oil, yogurt, shea or cocoa butter and lemon juice. The problem with natural home remedies is keeping it in check. How much do you use and how often? Should you use these ingredients alone or mix them? If mixing, what are the proportions? Eggs whites are natural enough, but other products found in your kitchen like the jar of mayo that has been in your refrigerator for months may not be as “natural” as you think. I couldn’t with a good conscious let my friend coat her hair in a thick paste of oily mayo. While I understand the reasoning behind these home remedies, I know there are better ways. 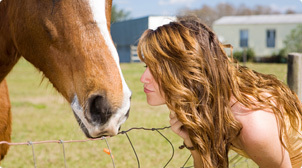 Mane ‘n Tail products use natural ingredients like oils and proteins in their products and they have already done the testing and research to know that their combinations of ingredients work. Two of our leave-in conditioning cremes use natural oils – one with olive oil, one with carrot oil. Olive Oil Crème combines its main ingredient with other essential oils and natural herbs in an exclusive hydro-gel formula that rejuvenates the natural elasticity and strength of hair. Our Carrot Oil Crème uses beta carotene, which our body converts into vitamin A, known to renew hair cells caused by styling damages. Some of our other products that use natural ingredients include Herbal-Gro Conditioner, which contains sweet almond oil, citric acid oil and Shea butter. Our Color Protect Shampoo uses sunflower seed oil, olive oil and fruit oils. I told my friend to try some of these products. I also encouraged her to read the labels before she spent even more money on hair care. Marketing and packaging often dictate what products we buy, yet the ones with the fancy labels and movie stars in their ads are not always the products that work best for us. A little research can save you money and save your hair in the process.